Are you looking for the perfect holiday gift for under $25? Scentsy offers a great selection for every age, male and female. Here is your $25 gift guide for the holiday season that includes Scentsy products from every category. Mom will love our luxury hand cream, or perfume roller. Dad will appreciate the soft, smooth skin after he shaves with his shave and shampoo bar. Everyone will think the house smells amazing with our new Apple Butter Frosting. So many gifts of fragrance for $25 and under this holiday season. As part of our gifts for kids under $25, parents and kids will love our new Scentsy Bath Smoothies. Watch it magically transform into foam right out of the pump! Moms and Dads will appreciate how this sulfate-free hair and body wash gently cleans from head to toe, leaving nothing behind but smiles and heavenly fragrance. Available in Kids fragrances. 6.7 fl. oz. We also have our new Scentsy Kids fragrance bars designed to delight kids and the young at heart everywhere. 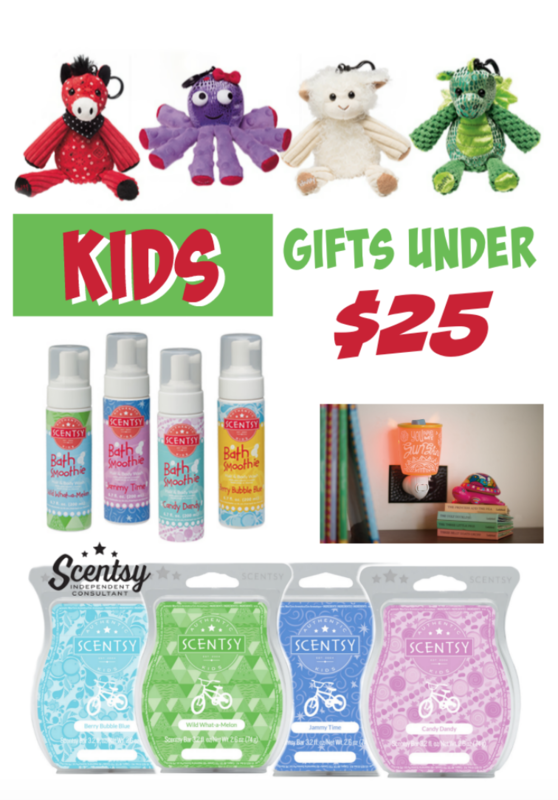 Scentsy Kids fragrances are available in Bath Smoothies, Buddy Clips and Scentsy Bars. You can order a money-saving bundle, 3 for $14 -that will keep your gifts under $25. We have lots of great gifts for her under $25. Our new luxury velvet hand cream is an ultra-rich, nourishing cream that soothes and softens, leaving hands velvety-soft and beautifully scented. 2 fl. oz. Check out our new fine fragrance roller with a kiss of parfum to trace along your pulse points, or wherever you wish. .34 fl. oz. These are the perfect gifts for Mom under $25! Dad will appreciate our gifts for him under $25. There’s a new bar in town that’s part of our new Scentsy Groom line. This bar is a gentle, soap-free, all-purpose daily shampoo, shave bar and body wash that leaves skin and hair subtly scented and cleansed. No poufs or loofahs. Just clean. 4.5 oz. It’s become my husband’s new morning favorite. Check out our new Scentsy Groom Face Balm and Cream Shave Soap -sure to become a favorite part of his morning routine. 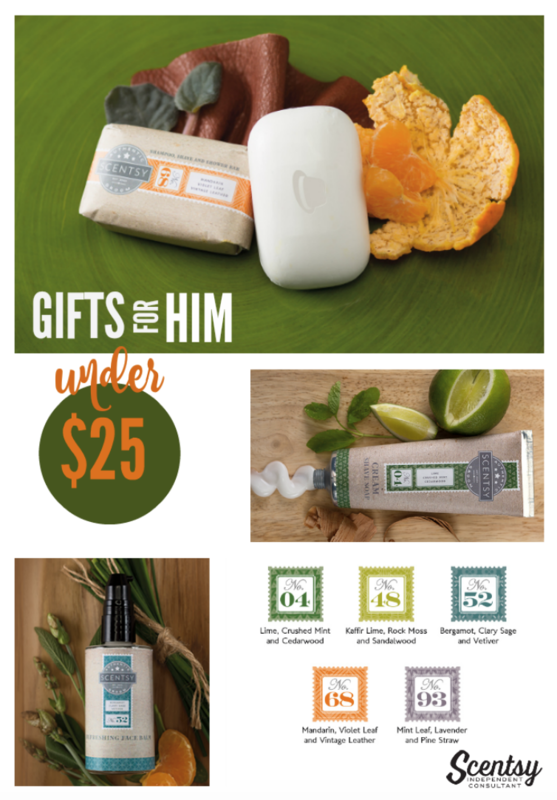 These will make great gifts for him and all under $25 each. Scentsy offers many products that would make great gifts for the home under $25. Most of our Scentsy Nightlights, our Scentsy Essential Oils & Essential Oil Blends, or Scentsy Bars, and our combine and saves that are under $25 and would be the perfect gift. Check out my Scentsy Products page for more gifts for under $25. It’s the season of giving, and we’ve got everyone on your list covered. Meet our newest Scentsy Buddy, Gilly the Scentsy Monster! How cute is this little cuddly monster with the fun horns and blue hair! I LOVE this guy! Think of all the imaginative play to be had with Gilly. This guy will definitely need to come home because there’s dragons to slay, mountains to climb, car rides to be had, and memories to be made. Check out all of our current Scentsy Buddies here. 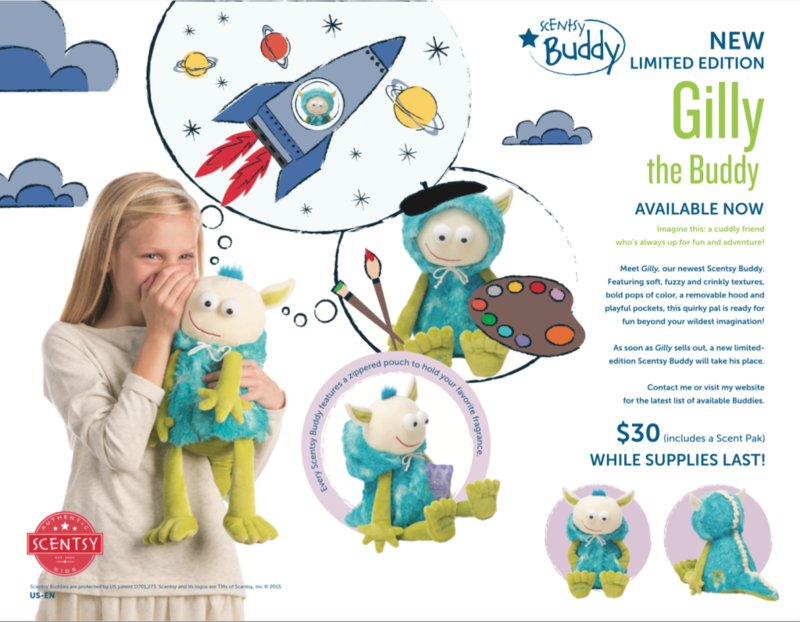 Gilly the Scentsy Buddy is our newest limited-edition soft, squishy, fragrant stuffed animal, well a monster really! How adorable is he with his green legs and feet, and his blue furry coat with removable hood. I think this guy will be your child’s new best friend! This is the cutest little monster you’ll ever meet! You’re child, or the child at heart, will adore this little guy, especially as a gift! Our Scentsy Buddies are limited-edition and when they’re gone, that’s it! Hurry and get yours! Each Scentsy Buddy comes with a Scentsy Scent Pak of your choice. When you select your buddy, simply choose the fragrance, then check out. Click on the link to my online Scentsy store, then shop for your favorite Scentsy Buddy. I think you’ll agree that Gilly the Scentsy Monster is the cutest though. I’m already in love with the cutest Scentsy Buddy EVER! Seriously, check out his crooked smile, his pockets, and that little tuft of blue hair. This guy needs to be part of every Scentsy Buddy collection, so don’t miss out! Order yours today! What’s all the hype about Scentsy Peppermint Dreams products? The fragrance of peppermint dreams is like a a delicious cool mint, inside a gooey warm chocolate cupcake. Our classic wickless candle Scentsy Bar is a remarkable medley of wax and fragrance. Break it apart, add a cube or two to your Scentsy Warmer and infuse your home with scent. I love the new look of our Scentsy Scent Circles! A fun, unique design, and a great way to add a burst of Scentsy fragrance wherever you go. 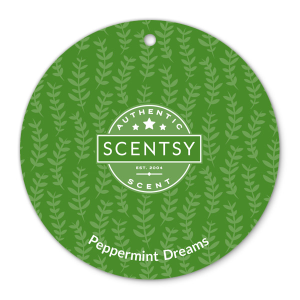 Visit my online Scentsy store to purchase your Peppermint dreams Scent Circle. Scentsy Scent Paks are great and multi-funcional! Place in drawers, closets, suitcases or a soft and squishy Scentsy Buddy for lingering fragrance. 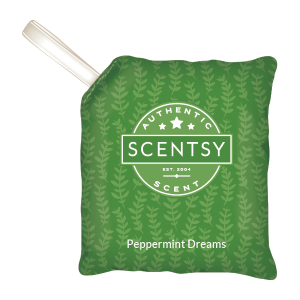 Buy a Scentsy Peppermint Dreams Scent Pak from my online Scentsy store. Scentsy Room Sprays will set the mood with a kiss of fragrance wherever and whenever it’s needed. I use our room sprays for a quick spritz before company, a public restroom, and especially in musty smelling hotel rooms. Here’s a tip: While in your hotel room, spritz the Scentsy Peppermint Dreams room spray into the air over the hotel air conditioner/heater for better room coverage. Purchase your Scentsy Room Sprays from my online and enjoy a hassle free, direct to your door, package from UPS. You can order Scentsy Peppermint Dreams products from my online Scentsy store and enjoy the quick, hassle-free shipping direct to your front door. My loyal online Scentsy customers (yes, we have an awesome Scentsy VIP program!) enjoy the benefits of staying updated with the latest sales, promotions, and Scentsy money saving offers. Buy Scentsy online for convenience and easy shopping. I’m so excited about our new Gingerbread House Scentsy Warmer. One of my favorite holiday traditions to do with my family is make gingerbread houses, so when this warmer came out, I knew I had to have it! 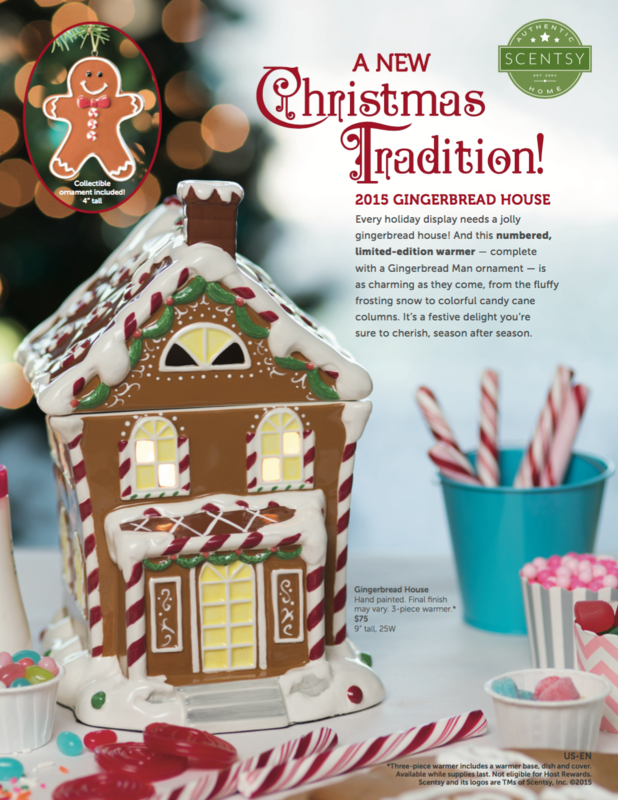 Our new limited edition Scentsy Gingerbread House is numbered, and a limited-edition. What does that mean? It means you better hurry and visit my online Scentsy store to purchase this fun Gingerbread House Scentsy Warmer before it’s gone! How fun is it that included with the new Scentsy Gingerbread House is a cute little Gingerbread Man ornament. He is adorable, and perfect to hang on the tree. The great thing about this Scentsy Gingerbread House and Gingerbread Man ornament is that there is never a frosting mess to clean up. Bring in a new Christmas tradition with our gingerbread house, and add memories of fragrance while you spend time with family decorate your real gingerbread houses. This Scentsy Warmer is no longer available. Click here to view our current Scentsy Warmers. 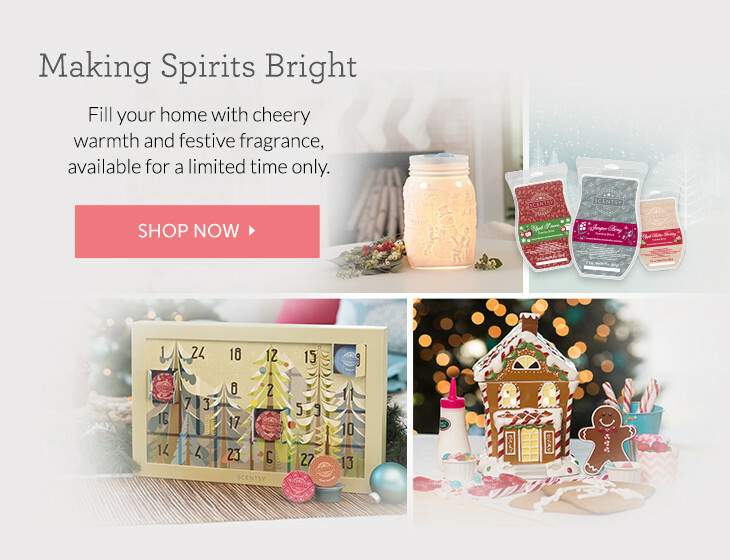 Visit my Scentsy online store which offers direct shipping for all your gift-giving needs. You can buy Scentsy online and enjoy the holidays stress-free knowing you’ve shopped for all your loved ones. When you order Scentsy online, your items will be direct shipped in a timely manner. Just think of the smiles across the miles, or right under your own Christmas tree. In addition to our new Gingerbread House Scentsy Warmer, Scentsy offers gifts for everyone -from the smallest to the tallest! Check out my Scentsy online store for the fun Scentsy Kids collection. We have our new Scentsy Essential Oils and Diffusers, as well as our wickless candle bars and Scentsy Warmers. Our Scentsy Groom line is my husband’s new favorite -from shower to shave, it’s SO good! Who wants to give laundry supplies as stocking stuffers? Well, ME!! Since I’ve started using Scentsy Laundry products, I’m just a little addicted to washing clothes -seriously! Our Scentsy Skin feels wonderful after a shower, and smells beautiful -also perfect for stocking stuffers. 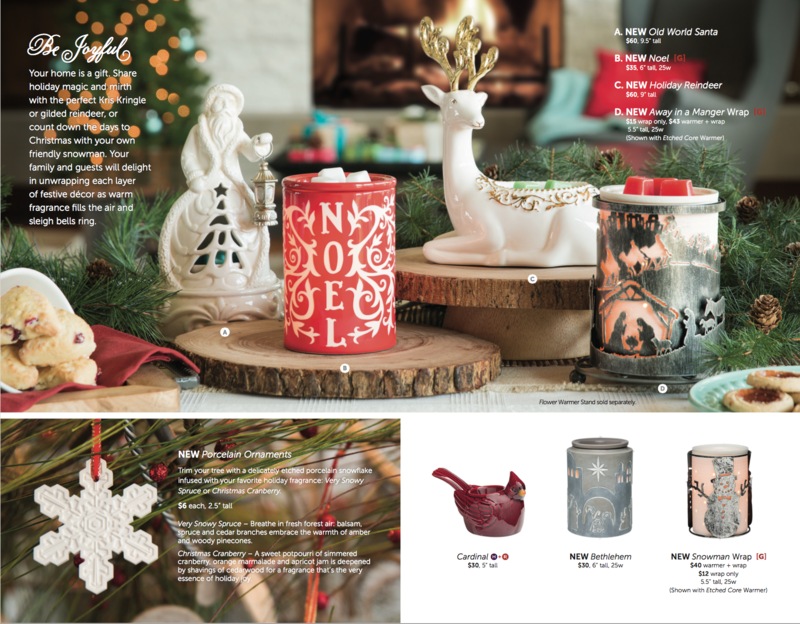 Scentsy recently came out with our new Holiday Collection brochure filled with the best Christmas gifts for 2015! There are so many great Scentsy products, including our fragrance Scentsy Bars that will be perfect for gift giving, holiday decorating, and are sure to delight those you love most this holiday season. Need the perfect gift for that special someone? Scentsy has gift ideas for everyone on your list. Be joyful because your home is a gift. Share holiday traditions and magic with Kris Kringle, or a gilded reindeer. Count down the days to Christmas with your own friendly snowman. Your family and guests will delight in unwrapping each layer of festive décor as warm fragrance fills the air, memories are made, and joy and happiness are shared by all. 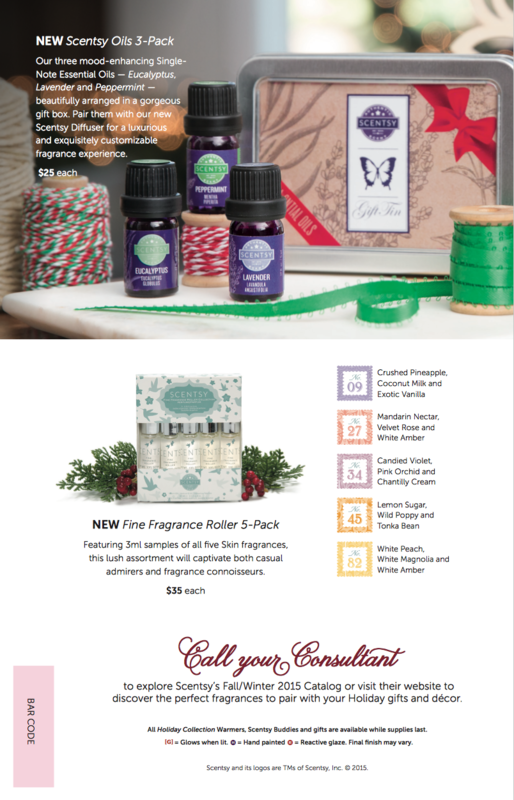 Scentsy Holiday gift ideas for 2015 will help you find that perfect gift. We have new Christmas Scentsy warmers that are wickless and offer safe alternative, quality fragrances to help create fun memories, special gift bundles to help save you money, Scentsy Buddies and Scentsy Buddy Clips that will create smiles on children and grown ups alike, a Scentsy Warmer and wrap for your Nativity collection, fun scented porcelain ornaments for your tree (or your car! -…and hello stocking stuffers! ), nightlights for those smaller areas, gift boxes shaped like gingerbread houses, and a new Snowman Countdown warmer. Create your own stories with one of our 3 fragrance books. 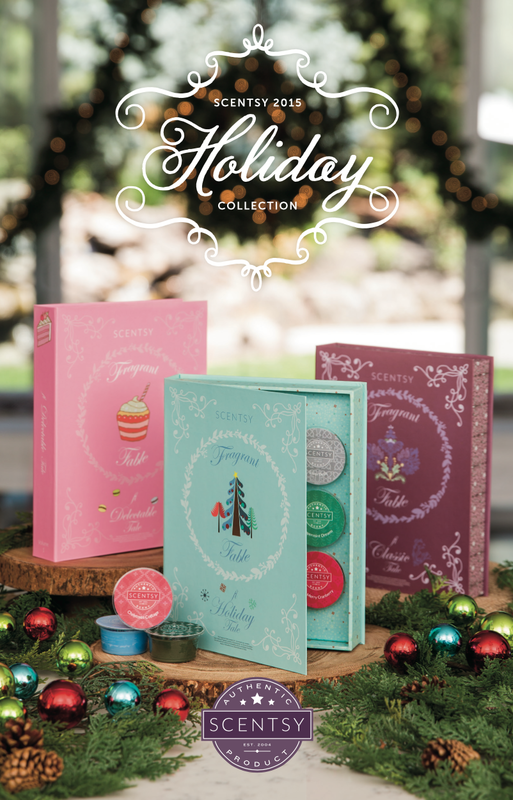 Each book contains 10 1-ounce Scentsy Bar wax samples that capture the theme. 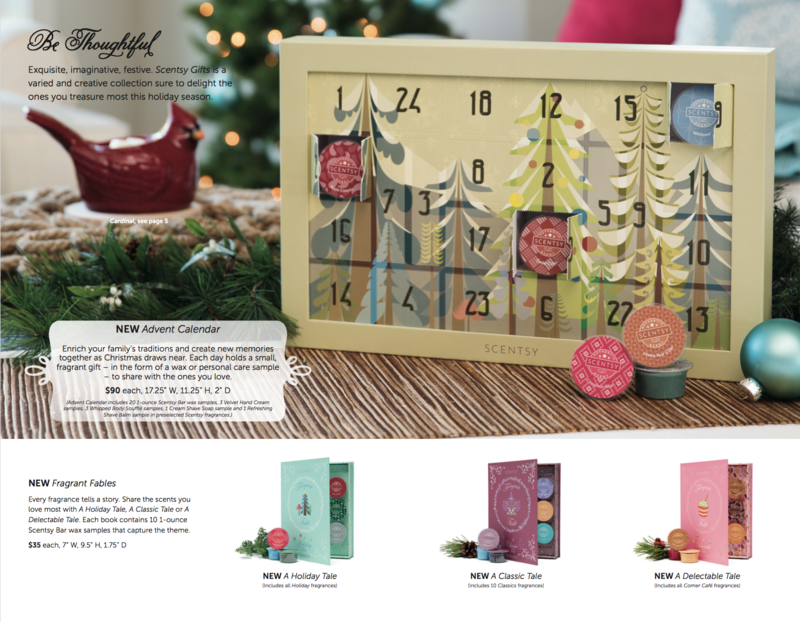 Also available is our new Scentsy Advent Calendar. Enrich your family’s traditions and create new memories together as Christmas draws near. Scentsy Christmas gifts are only available while supplies last. 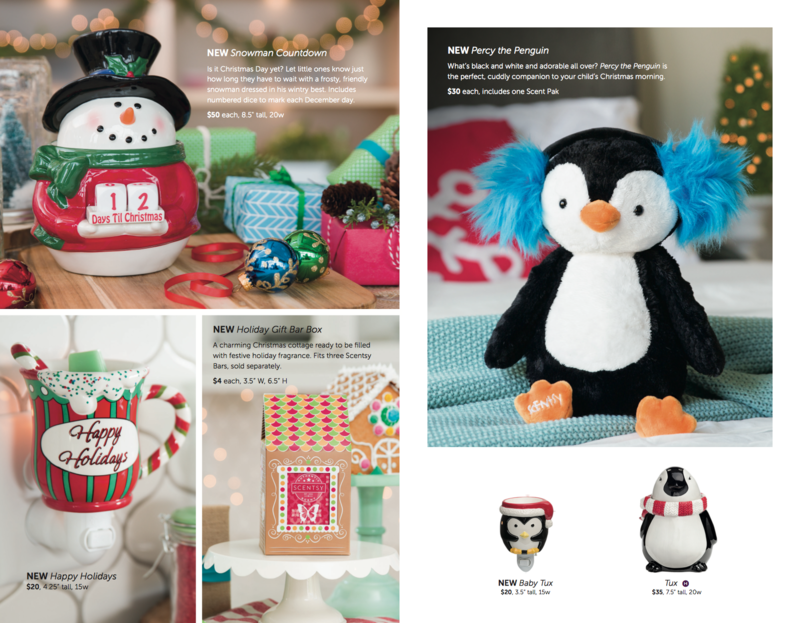 Visit my online Scentsy Store and buy Scentsy Christmas gifts online before your favorite items are gone. Scentsy makes it easy to send gifts too. When you order Scentsy products online, your order will be direct shipped to you or your loved one. Have a wonderful holiday season, and a very Merry Christmas!